HAMPTON, Va. (Dec. 7, 2017) — Hampton University will have a press conference Friday, Dec. 8, 1 p.m. to announce its new football coach. The announcement will be made at the Hampton University Student Center Theater. A live stream of the press conference can be viewed at media.hamptonu.edu. Media interested in attending this press conference should contact the Hampton University Sports Information Office at (757) 727-5757. Established in 1902, the Hampton University Football program has been a corner stone of this world-class institution. 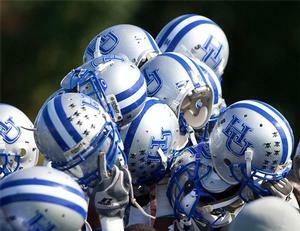 Throughout its 117 year history, Hampton University Football has an overall record of 565-431-34. Hampton Football has produced 76 All-Americans, 5 SBN National Championships and 19 total conference championships. Hampton, a founding member of the Div. II Central Intercollegiate Athletic Association, posted a conference record of 292-245-27 during its 83 year membership. During Hampton’s 22 year membership in the Div.I Mid-Eastern Athletic Conference Hampton posted a 116-67 conference record.